Why was the Merneptah Stele a significant archaeological discovery? Merneptah was a Pharaoh who ruled over Egypt in the late 13th century B.C. The son of Ramesses the Great (Ramesses II), Merneptah was the fourth Pharaoh of the 19th Dynasty. 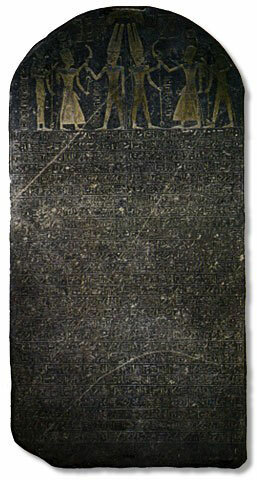 The “Merneptah Stele” is the name given to a stone slab engraved with a description of Merneptah’s military victories in Africa and the Near East. It was discovered by renowned British archaeologist Flinders Petrie at Thebes in 1896. The Merneptah Stele is significant to biblical archaeologists because it is the earliest extra-biblical reference to the nation of Israel yet to be discovered. The mention of Israel is very short; it simply says, “Israel is laid waste, its seed is not.” Nevertheless, despite its brevity, the reference is very telling. It indicates that at the time the inscription was engraved, the nation of Israel was significant enough to be included by name among the other major city-states which were defeated by Merneptah in the late 13th century B.C. This implies that Israel was a major player in the region during the late 13th century, serving to corroborate to a degree the biblical narrative. Because it remains the earliest known extra-biblical reference to the nation of Israel, the Merneptah Stele is also commonly known as the Israel Stele, or the Israel Stela (stela being another way to say and write stele). It is currently housed in the Cairo Museum in Cairo, Egypt. The Merneptah Stele, which dates to about 1230 BC, was discovered in Thebes, Egypt in the late 1800’s. The Inscription contains a hymn and a list of the Pharaoh's military victories. The Nation of Israel is on the list of conquests, which scholars believe is the earliest reference to Israel outside the Bible. The Merneptah Stele currently resides in the Cairo Museum, Egypt.